Hello everyone. This is Sherise, your designated blogger for Riverwood’s 2009 trip to Enaleni. It’s exactly 3 weeks from today that our team is leaving for Swaziland, Africa and I think it’s safe to say that all 20 of us are very excited. Of course, mixed in with that excitement is that little twinge of anxiety that comes from the approaching unknown, but God is bigger and he knows the purposes each of us will serve while in Africa. The next three weeks will fly by in a whirlwind of last minute preparations. 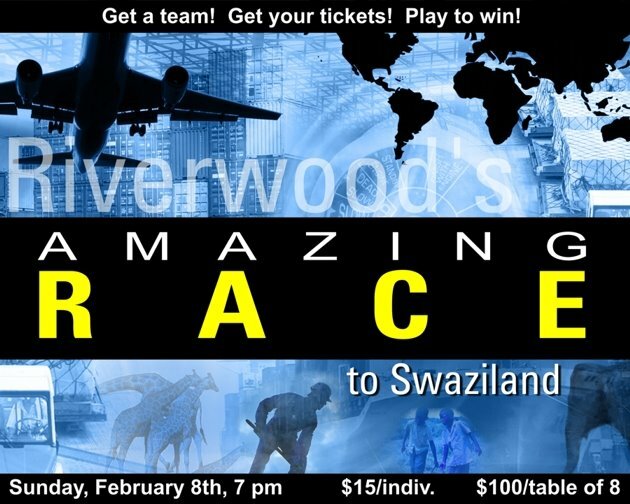 We have some more fundraising to do, primarily through the Swazi Market during the weekend services at Riverwood and our big event on February 8th – Riverwood’s Amazing Race to Swaziland. Tickets for the Amazing Race event are on sale before and after each of the weekend services. The cost is $15 per ticket, or you can buy a whole table (of 8 seats) for $100. In addition to all this, we have vaccinations to get, final details to work out, more team building to accomplish, and so on and so forth. Before we know it, we’ll be off. It’s uncertain at this time how frequently we’ll be able to update the blog once we’re on the ground in Swaziland, but we’ll do our best to keep you posted. That’s all for now. A more detailed itinerary and introductions to the team will follow sometime in the next few weeks. I look forward to sharing our journey. In the meantime, feel free to check out the following links. Thanks for the update Sherise! Great 1st post.